A video of Mollie Tibbetts taken one day before she disappeared appears to show the college student was happy and smiling, which is said to be her “normal, outgoing, happy self,” her friends told the media. This video was supposedly recorded on July 17 and posted on Snapchat by Olivia Ritter. Ritter described herself as Mollie’s co-worker and friend. Tibbetts is the 20-year-old University of Iowa sophomore who was last seen jogging in the Brooklyn, Iowa area the next day on July 18th. The video, which is posted above, shows Tibbetts wearing a tie-dye shirt while sitting on the floor of the art gallery at Grinnell College which is located about 15 miles west of Brooklyn. 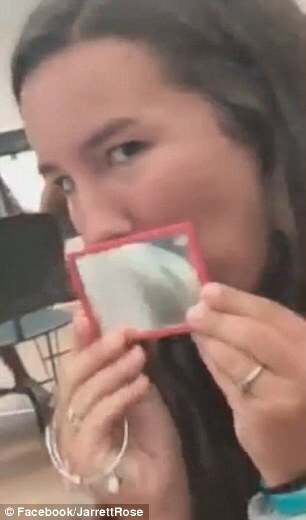 She is seen laughing as putting up a small mirror to her face and sticking out her tongue. Tibbetts’ iPhone and Fitbit are also seen in this footage. Both items police and family members say have not yet been found and both could offer clues into her current whereabouts and what actually happened. “Meanwhile, Mollie’s father told Fox News on Tuesday that his daughter didn’t just ‘get up and walk away,’ so it’s logical to assume she has been abducted. He said: ‘To that person, you’re probably very afraid. This isn’t probably a situation that you anticipated. Mollie’s father previously said he believes there is someone out there with information that could help located his missing daughter. ‘It doesn’t matter what we’re going through, we just need people to think – because somebody knows something, and they don’t even know it’s important,’ he said. He also said on Monday night that he feels his daughter is with someone she knows who is now ‘in over their head’. ‘If someone out there is holding Mollie, and they’re in over their head and they’ve made a horrible mistake, you can end it now before it goes any further,’ he said at a press conference. Later, he said he was encouraged by the fact they had not found her body. ‘I’ll be honest with you early on I wasn’t as hopeful as I am now. But while her father is hopeful, Mollie’s mother says she is in ‘purgatory’ and is tortured by her daughter’s disappearance. ”I’m either going to be headed up to heaven or down to hell, depending on the result,’ Laura Calderwood, told DailyMail.com last week. Meanwhile, police say they are looking at surveillance footage from businesses along the route Mollie usually jogs. The data from Mollie’s Fitbit, which contained GPS-enabled tracking, is also being analyzed. But they revealed no specific details about developments in the case at a press conference on Monday. On Monday, it was revealed that a pig farmer questioned by FBI agents over the disappearance had refused to take a polygraph test. Wayne Cheney, 56, who lives in a trailer in Guernsey around 10 miles from Brooklyn, appeared on the radar of authorities after a red shirt similar to Mollie’s daycare center uniform was found in a field near his home. However, it is not clear if it the shirt actually belonged to Mollie or not. Cheney, who has previous convictions for stalking an ex-girlfriend, has spoken three times to police. He has also given interviews where he laughs nervously and says he had no idea where Mollie is, but suspects ‘some guy has her’. When the FBI asked him to take a polygraph test, he refused. ‘I don’t need to. It’s stupid,’ he told The Des Moines Register on Monday. Officers from the FBI, state and local law enforcement agencies are working to find her. I know everyone on the internet has a theory, and I am no different, but why would a hog farmer who has nothing to do with all this refuse to take a polygraph test in order to prove himself innocent and to let the police focus on other aspects of the investigation? I know a polygraph test is an invasion of privacy in many ways, but this is a girl’s life we are talking about here. Seems a bit odd, don’t you think? The parents of the girl announced a reward for information leading to Mollie’s safe return which is now reported to have passed $300k dollars. Those with any tips are urged to contact the Poweshiek County Sheriff’s Office at [email protected] or call 1-800-452-1111.